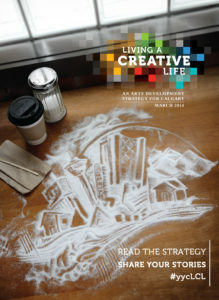 Living a Creative Life is an arts development strategy for Calgary, by Calgarians. Our Overarching Vision is: Calgary is a place that empowers every resident to live a creative life, fuelling a vital, prosperous and connected city. Our Mission is: To align and activate Calgarians in creating a vital, prosperous and connected city through the arts. How was the strategy produced? The strategy was produced through a rigorous consultation process facilitated by Calgary Arts Development and is a result of our year as a Cultural Capital of Canada in 2012. The strategy framework was finalized in January 2014 and articulates Calgarians’ shared goals for the arts in five focus areas (Creative Communities, Centre City Arts District, Arts Incubation, Artistic Exchange, and Youth & Education). Visit our Get Involved page to learn more about how to connect with Living a Creative Life.